Social norms comparisons are tools that are being used more and more often by energy and water utilities all over the world in order to induce households to conserve resources. Such conservation programs are appealing to utilities because they are an easy-to-implement alternative to raising prices and commonly result in short-term reductions in energy and water use of about 2-5%. However, the welfare effects of social norms programs are rarely discussed and assessed, especially in the context of municipal water supply. 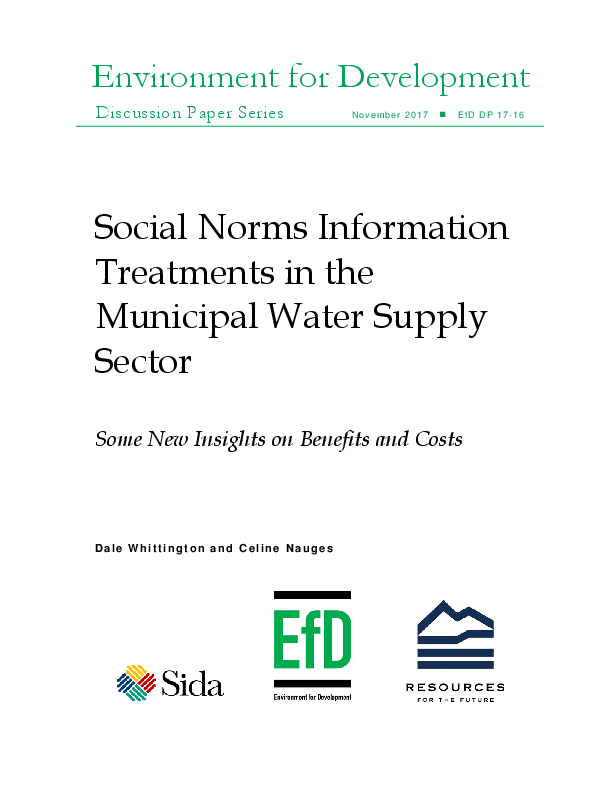 The purpose of this article is to propose a framework for identifying the costs and benefits of social norms comparisons and to provide plausible estimates for these components in the municipal water supply sector, using current knowledge for both developing and industrialized countries. Our calculations show that the outcome of a benefit-cost analysis of a social norms information treatment is highly uncertain and location-specific. We also present a simple benefit-cost analysis of a price increase that would lead to an equivalent initial reduction in household water use. The latter is found to be more likely to generate net benefits to the society as a whole in low- and middle-income countries, but we show that, in this case, households would have to bear most of the costs.